Spend the semester learning about robots while we experiment and play with them. We will we discuss what makes robots different from humans while exploring circuits and conductivity as well as simple machines. Over the course of the semester each participant will build one of these robots (pictured below). Every semester we build a differnet robotics kit than the last semester. Unlike other robotic clubs, each child will get to keep their completed robot at the end of the semester to show off to their friends! Here are some of the robots we'll be building in the 2017-2018 Season! The All Terrain 3-in-1 RC Robot Kit - ATR is a multi-function tracked mobile robotic kit. You can utilize different track modules and make your robot transform into 3 amazing variations: the forklift, rover, and gripper. Using the remote wired controller, command the robot to move forward, backward, turn, grip and lift. In forklift mode, the ATR is like a mini industrial fork lift, with the ability to lift up to 100 g in weight. In rover mode, the ATR’s tank-like treads can traverse any type of surface. And in gripper mode, the ATR’s strong arms grab and pull objects into its grasp, lifting anything up to 100g and moving it to your desired location. This kit allows students to create and recreate: Put it together, take it apart, make another module…It’s all about flexibility, and intelligent thinking. But luckily, kids don’t have to be robotics engineers to create and achieve. With the 3-in-1 All Terrain Robot, they learn as they play. Native to Australia, chalamydosaurus kingii (or frilled lizard) is one of the wackiest lizards to roam planet Earth. So in order to keep young lizard enthusiasts out of harm’s way, we have created a freakish robot lizard that is fun to play with. The Kingii Dragon Robot is a smart super lizard with artificial intelligence (AI). Similar to the original from Australia, when this robot feels threatened, it gapes its mouth, flashes its eyes, and dramatically spreads and flaps its frill (pleated material that encircles its head) in a threatening manner. If you are not intimidated by these shenanigans, it then turns around, front and back legs erratically move as if it were scampering away from danger. The Kingii Dragon Robot has an infrared sensor that is programmed to “escape” or “follow-me”. If the infrared sensor is activated in the “escape” mode the robot will automatically act “shocked!”, spreading its frill, dropping its jaw, illuminates its bicolor LED eyes and will scurry away until it escapes to a safe distance. If the infrared sensor is switched to the “follow-me” mode using the 2 way function switch, then the robot will assess danger by bluffing the attacker (unfurling and shaking its frill). When the robot does not sense danger it might approach you like a pet lizard. Thank goodness, that unlike the wacky frilled lizard that roams in Australia’s tropical woodland this Kingii Dragon Robot is whimsically kooky and fun to build. 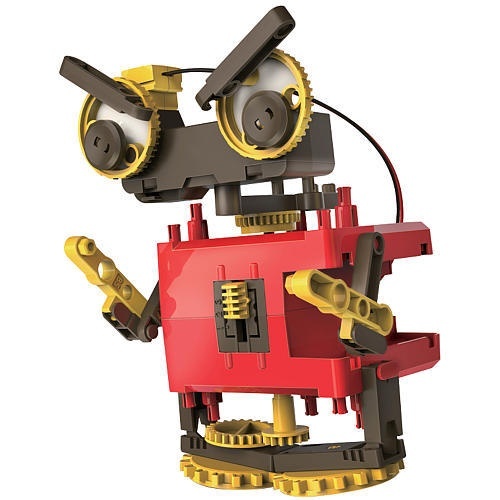 A boost in confidence- the EM4 Educational Motorized Robot Kit is your 3-speed vehicle to positively impact a young builder by using robotics theory. This kit is designed for the lovers of simplicity. Everything from its compact easy-assembly design to its need for only one AA battery provides your child with a fun and easy-to-assemble robotic playmate. A child can bring EM4 Educational Motorized Robot Kit to life in one of its four exciting modes: Cricket—who’s a joy on 6 legs, Beast—the master of bipedal movement, Trailer—the little engine that could move forward thanks to its motorized transmission, and good ole Grandpa-bot—everyone’s favorite bobble-headed gear-driven family member. Each mode is equipped with its own unique form of movement and with a few easy steps, transforming between each mode is a breeze.